The second National Indexing Day was held on Thursday 29 March 2018, following our successful inaugural online event in 2017. 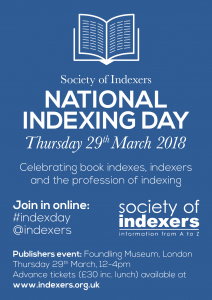 For National Indexing Day 2018, the Society of Indexers (SI) ran a very successful half-day event for publishers at the Foundling Museum, Brunswick Square, London. Following a welcome from our honorary president, Sam Leith, sessions and demonstrations by SI members focused on current indexing practices and digital developments regarding embedded and linked indexes for ebooks. There was also an ‘ask the indexers’ Q&A panel session and break times for publishers and indexers to meet and mingle. The event provided a valuable opportunity to promote the profession of indexing and to learn from each other for the creation of better book indexes. The detailed programme for the event is available and you can catch up with a ‘story’ summary from social media of all the events leading up to National Indexing Day, the day itself and the aftermath on Wakelet.